I am currently working on a researched post, which is taking a bit of time to write. While I'm working on that, I've decided to put this post together about one of my favorite fandoms. I hope that you all enjoy it and leave a comment about your thoughts - I would love to hear what you all think. Star Trek now has 13 movies and 7 movies over the past 52 years. Though Star Trek: The Original Series first aired on 06 Sept 1966, Star Trek: Enterprise (first airing 26 Sept 2001) [Note 1] takes place first. The events of this series takes place in the 22nd century, in the years 2151 - 2155, with the controversial final episode [Note 2] taking place in 2161. The uniforms of this period were blue jumpsuits that were reminiscent of flight suits of US and NATO military aviation. The uniforms bore colored piping that indicated their Starfleet division (Gold = Command, Blue = Sciences,Red = Operations, Red & White = Flag Officers) and was in use with the Earth Starfleet from 2143 until at least 2161 with very few changes. 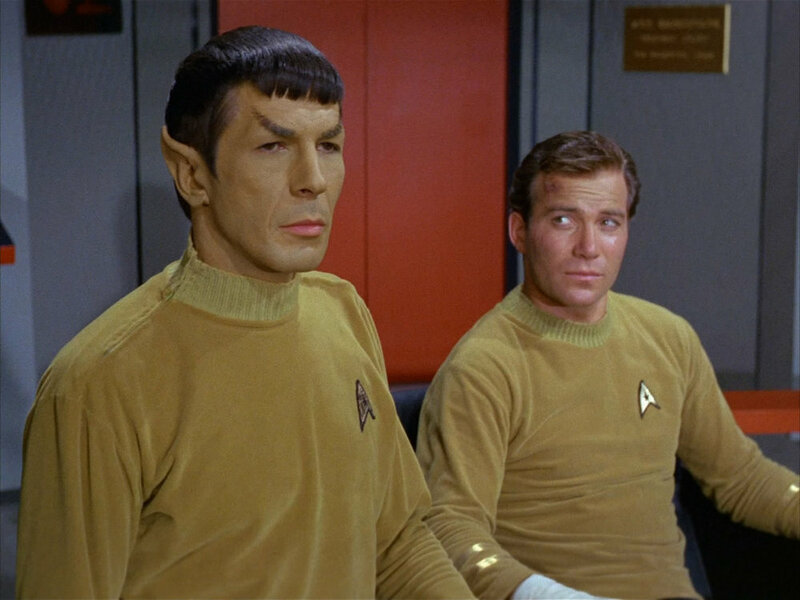 Starting in the second season, the uniforms were dyed a lighter shade of blue, and in the series finale, the uniform changes were: epaulets on the shoulders, an additional mission patch displaying the Starfleet logo worn on the right sleeve, and a name tag worn inside the piping above the left breast. Next was the uniform that was introduced in Star Trek Beyond (release date 22 July 2016) - it was introduced sometime in the 2160s and was similar to the previous uniform design of the Earth Starfleet - a gray (instead of blue) jumpsuit with the mission patch for the ship the officer served on sewed onto the right shoulder and the Starfleet insignia sewed on the other. The division colors remained the same, but were positioned differently, and the Delta Shield was prominent on the left breast. It is unknown how long this uniform remained in service, because the next uniform we see is in 2233 [Note 3]. By 2233, Starfleet uniforms had changed. As seen in Star Trek (2009) (release date 08 May 2009), the uniforms were tight-fitting body suits with black piping. Like the its predecessors, the uniforms had pockets, but the division colors underwent a drastic change: Command = Blue, Engineering = Goldish Green, Sciences/Security = Pearl Gray, and Medical = White. 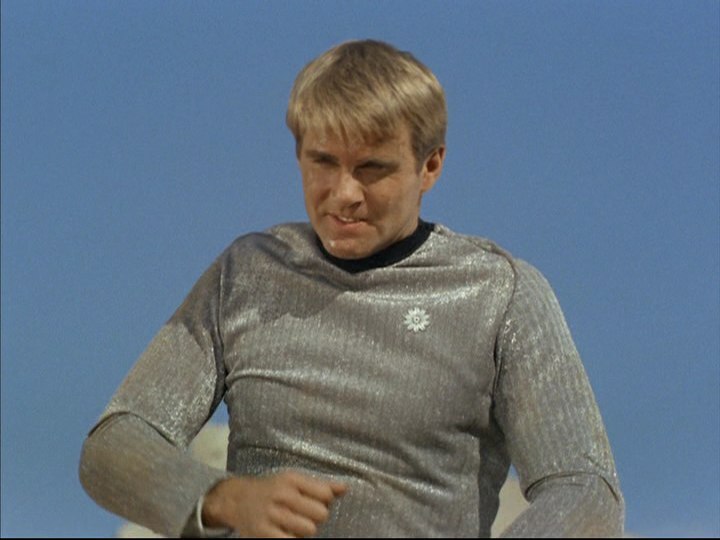 This uniform is the first one that clearly uses the sleeve ranks that were introduced in Star Trek: The Original Series. This is also the uniform that we see before Nero's incursion, splitting the timeline. Timeline split. Prime timeline follows. Star Trek Discovery first aired on 24 Sept 2017, becoming the 7th television series in the Star Trek franchise. The series premier begins on Stardate 1207.3 (Sunday, 11 May 2256), and then Episode 3 picks up starting in November 2256. However, in flashback scenes, we see that the uniform was in use in 2249 at least, possibly earlier. This uniform is considered being part of the prime timeline [Note 4], and is Federation blue in color. However, the division colors take the most radical change ever, using metallic colors: Gold = Command, Silver = Science, and Bronze = Operations, with captains and admirals having extra shoulder piping. The ranks are on the Delta Shield, with the reverse having the wearer's name and serial number. This era is unusual in that Starfleet Cadets also wear the same uniform as officers. The Trekyards team has great reviews of this uniform. We breakdown the Star Trek: Discovery uniforms with the help of an incredible graphic from trekmovie.com and the creative work of @ geekfilter from twitter. Aaron Harvey does great work and this graphic is insanely cool. A very cool uniform to be sure. But is it pre-TOS? Like....at all? Do the Star Trek: Discovery uniforms we see in the trailer fit in Prime Timeline? We think they might and we will show and tell you why! At the same point of time [Note 6], there is another uniform style in use - the uniforms introduced to us in the first pilot episode of Star Trek and reintroduced in the second pilot episode. The events of "The Cage" occurred in 2254, while "Where No Man Has Gone Before" took place in 2265 (Stardate 1312.4). This uniform had no pockets, and the sleeve ranks were styled very differently than both previous and future incarnations - officers had a single sleeve stripe, senior NCOs had a broken stripe, and all other enlisted had no insignia (later, captains wore two sleeve stripes, but the rest were unchanged). Also, this uniform had different versions for male and female crewmembers. This uniform was unusual in how the uniforms were color and insignia coded. The uniforms came in four colors: greenish-gold, khaki-beige, blue, and reflective gray. The Delta Shields had different symbols on them: a star, a geometric curve, and a circle with two longitudinal lines dividing it. Reflective gray, with a 10-pointed star, was for cadets, while the other three uniforms and symbols denoted if someone was in command, helm/navigation, engineering/communications, administration, science/medical, and security. From left to right: Lieutenant Leslie, Lieutenant Brent, unnamed command division officer, unnamed operations division officer, and Lieutenant Hadley. Now, the big question here is, where is Star Trek: Discovery going to go with this? As this is in the prime timeline, we know that the next uniform is the classic design from the run of Star Trek: The Original Series and Star Trek: The Animated Series: Command Gold, Science Blue, and Operations Red [Note 5]. Will we see any hints of this style of uniform? Even though Discovery appears to be a soft-reboot of the franchise, will they try to start merging the two styles of uniform? I am looking forward to finding out. After the incursion by Nero in Star Trek (2009), we see Starfleet using a uniform style similar to that in Star Trek: The Original Series: Command Gold, Science Blue, and Operations Red, but with Delta Shields in the design of the fabric. We also see more styles of ground-side and admiralty uniforms, as well as a change to the dress uniforms and a completely new cadet uniform. These uniforms are seen as early as 2258, and possibly earlier, and has the gender-segregated uniform variants. The sleeve stripes to indicate rank are kept from the previous iteration of the Starfleet uniform, although one of the female variants lack indication of rank. By 2263, Starfleet introduced a new style of uniform. Star Trek Beyond kept the previous uniform colors, as well as the gender segregated uniform styles. However, instead of having a sleeveless variant, a variant with pants was introduced. Now, the big question here is, where will the Star Trek films go with this? Will there even be a Star Trek XIV? In the prime timeline, we know that the next uniform is the much derided "pajama uniforms" from Star Trek: The Motion Picture. Will we see any hints of this style of uniform? Or, as the reboot films have gone their own way, will we skip those and see something similar to the much beloved monster maroons that were first introduced in Star Trek II: The Wrath of Khan? Main Cast of Star Trek: The Motion Picture. Main Cast of Star Trek IV: The Voyage Home. Back in November, I made a post called "A lighter post - my top 10 favorite Science Fiction uniforms, ranked" - here, I will just list out my favorite uniforms of the 22nd and 23rd century. The Trekyards team also gave us their top 10. I'm curious as to what your favorites are - please leave a comment! Star Trek: Enterprise was originally titled Enterprise until Season 3. "These Are the Voyages..." was a holodeck adventure that Commander Riker was on, under the advice of Counselor Troi, during the events of the Pegasus incident of 2370. This is likely why there are a number of inconsistencies in this episode - as well as such a negative fan reaction. In the Star Trek: The Animated Series episode "The Time Trap" we see a human being in a Starfleet uniform. We are led to believe that she is from the Bonaventure, lost at least a century before, but perhaps even longer. The information given, however is vague at best, and other sources inconsistent, meaning that she could be from anywhere between the late 21st century and the late 22nd century. Bryan Fuller, the co-creator of Star Trek: Discovery, said that Discovery takes place in the Prime Timeline at a press junket in 2016. The gold uniforms were actually green in color, but because of color correction technology of the era and stage lighting, they looked gold. According to the website Comic Book, the book Star Trek: Discovery: Desperate Hours explains why the two uniforms are in use at the same time - the colorful ones were in use exclusively by Constitution-class starship crews. Newer PostSuper Bowl: Not so good for cities. Older PostDr. King's Final Speech: "I've Been to the Mountaintop"